Guests from the “Indigenize Our Minds” program at the Native Canadian Centre of Toronto visited Grade 6 students at Crescent School on November 16. The students are working on an art project that will be used to make Crescent more welcoming to members of the local Indigenous community. 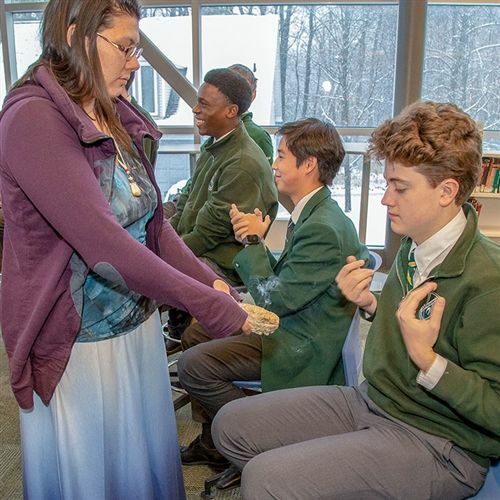 As part of the visit, the students participated in a purifying “smudging” ceremony, which uses smoke from burning sacred plants. The boys also learned about the Medicine Wheel and the Seven Teachings of the Anishinabe people: Love, Respect, Courage, Honesty, Wisdom, Humility and Courage.